The orchid includes a long history of association with love and luxury. Elizabethans believed that satyrs, the half-man half-beast creatures of Greek mythology, fed on the beautiful orchids that emerged from meadows and woodlands. Ancient Chinese called the orchid, "the plant of the king's fragrance." Modern orchid fans cultivate them in private gardens or order blooms fresh cut for elegant wedding bouquets. Dark blue-and-purple orchids catch the imagination through a variety of hybrids and special floral dyes. Named after Singaporean botanist C. M. Mok, this trigeneric hybrid resulted from crossing Arachnis, ascocentru and Vanda orchids in 1969. Botanists created other hybrids from the original Mokara, creating distinctive star-shaped blooms present in a variety of colors. Mokara Princess Blue develops flowers in a rich, dark purple with blue undertones. Florists import purple-and-blue Mokara hybrids from farms in Vietnam and Thailand to use in weddings and other special events. In Shakespeare's "Hamlet," Gertrude invokes the name the early purple orchid when she tells Hamlet of Ophelia's death. The early purple orchid (Orchis mascula) includes nine subspecies of purple-blooming orchids. These orchids grow wild in the oldest woodlands and meadows throughout the United Kingdom. Vibrant, dark-purple blooms grow to 2 feet tall and bear flowers from April to June. In Scotland, hikers may spot the early purple orchid as late as July. Native to the Philippines, the rare blue Dendrobium orchid makes a splash in wedding and Mother's Day bouquets. Florists create dark blue-and-purple orchids by synthetically dying the Purple Bombay Dendrobium blue. 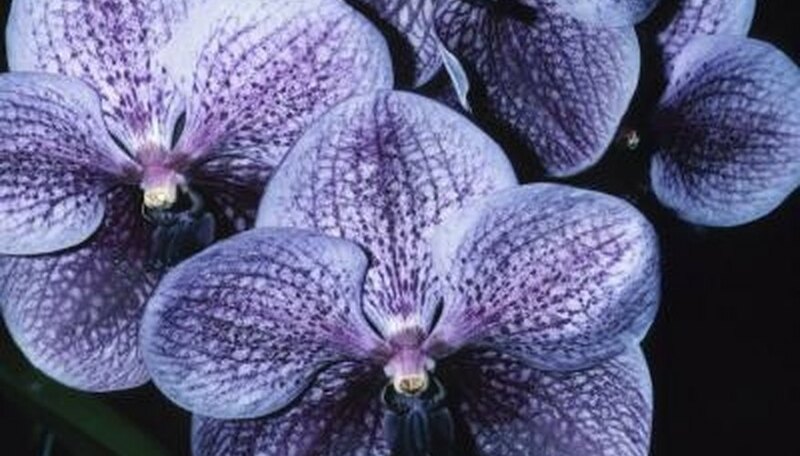 The orchid retains its deep-purple color while developing a rich, blue tone. Indian Blue Purple Dendrobium features dark-purple outer petals and purple-black inner petals. Other dark purple-and-blue toned Dendrobium orchids include the Salaya Blue, Mana Blue and Banglen Blue.